Smile. Yesterday my Etsy necklace arrived. I didn't see it till this morning tho because Varen had ordered for me after I coveted it on Twitter and it arrived at his offices. And he worked late. What a great way to start a morning ... with gifts :) And I *love* it. 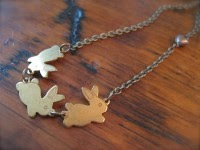 I was considering getting it engraved with Coal, Lily and Rex behind each of the bunnies, but they're really too tiny for that. lol that necklace is perfect for you!!! the bunnies are so cute. LOVe the bunny necklace! Varen has good taste in gifts.